In July 2017 I reached out Jessica Honegger via Instagram. I thought, what do I have to lose? I had been falling head over heels with Noonday Collection, a company she founded and is CO-CEO of. If you’ve not yet heard of Noonday Collection, get ready for your heart to be cracked wide open. Noonday Collection serves people worldwide by providing opportunity for dignified work. They walk into corners of the world where there are beautiful people and beautiful cultures, but not beautiful opportunity – and then, they create it. Noonday creates a big, wide open space for artisans in underdeveloped countries to flourish. Noonday sources handmade, fair-trade accessories and through a network of upwards of 2,000 ambassadors – creates a marketplace for artisans to show the best of what their culture has to offer. In July 2017 a few things were happening in my career, season 1 of The Courage to Become: Sister Stories of Hope had wrapped up, season 2 was about to begin. My first book, similarly titled, The Courage to Become: Stories of Hope for Navigating Love, Marriage and Motherhood, was about to publish. Reaching out to someone as accomplished and impactful as Jessica can bring up all sorts of nerves. What right do I even have to reach out to her? About 6 years ago my brother asked me to go sky diving with him. The night before our jump, I had butterflies, BIG ONES. Getting into a plane with AN OPEN DOOR, made my knees wobbly. Flying in a plane, seeing the trees get smaller and smaller as we flew to 10,000 ft. made me sweat. And approaching the of OPEN DOOR of the plane while 10,000 feet in the air –knowing I would be LAUNCHED OUT made me question my sanity. The diving instructor yelled, “Squat, approach the door, and hang your toes over the side of the plane.” OH CRAP. I was free falling from 10,000 feet negotiating a smile while my cheeks flapped in the wind. Was the hardest part landing? Falling? No. The hardest part was the lead up. So when I make big asks, like reaching out to Jessica -- I remind myself the hardest part is the lead up. If I can garner enough energy and courage to launch -- the rest will be fine. So I launched, made the big ask and after some coordination - the day came! I was on my way to the Noonday Collection home office to interview Jessica. I prayed that God would keep me grounded in kindness and love and that I would remain present. The space was beautiful and useful, just like their mission and just like each of Noonday’s pieces. Jessica greeted me with a big hug and we were off, chatting like two normal gals! What’s one thing you are proud of becoming? What keeps you going when you’re knee deep in mud? What’s your version of making it? Do you think you’ll do Noonday forever? What are your hopes for Noonday? What’s one think you’d still like to become? Being Noonday’s fuel requires a lot of hard work. Who modeled grit for you as a child? Where did you learn to work so hard? What’s the biggest surprise Noonday has brought you? Toward the end of our chat, we started talking about my book, The Courage to Become. And Jessica got up from her seat, walked over to a side table and said, “I think I have it here. Oh yes, here it is.” And she pulled out my book. Sometime in the fall, Jessica posted on Instagram and the spirit of the post was, What Can I help you celebrate? 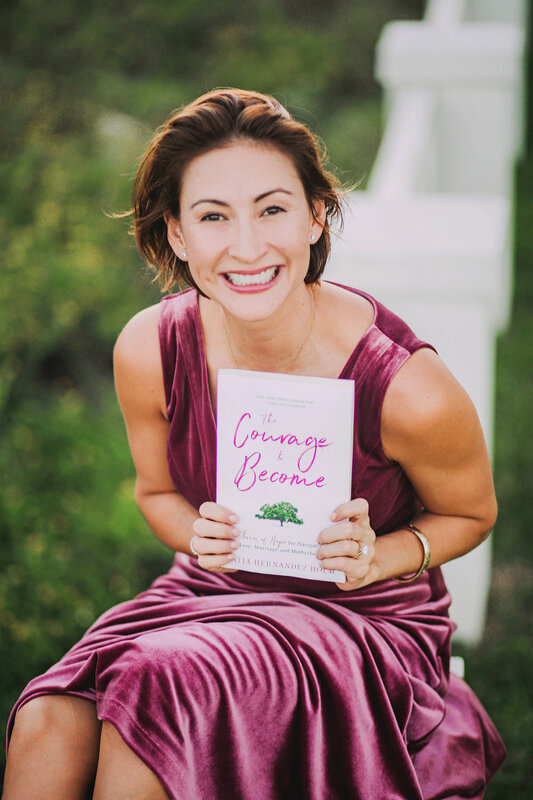 And I commented, “I just published my first book, The Courage to Become!” And she commented, “Grabbing a copy now!” And I thought it was sweet of her to show enthusiasm, but in no way did I think she’d follow through. So when she pulled out my book a few things were going through my mind. The first was gratitude, and the second was, she is who she says she is. She is a cultivator of community, a true supporter, a woman’s woman. I know what you’re thinking, where are all the photos of this wonderful day? In today’s day and age of promotion and hashtags and riding people’s coattails – No photo? No proof? No perfectly curated photo of this magical meeting. NOT ONE. Before I walked in, I prayed to God that he would help me stay in the moment and stay grounded, and he did just that. I just knew – it wasn’t a moment for selfies, or hashtags or Instastories – it was a moment to connect. I hope you’ve gleaned a little more about Jessica’s heart and Noonday’s mission, but what I really want you to know is that she brave, and loving and that she tries – really hard to change the world for the better, every day. I want you to know that she loves her family with all she's got. And I want you to know that she believes in you and when and if you’re ready, Noonday Collection will welcome you to the table of creating community, impacting social justice and creating dignified work for people all across the globe.